In philosophy, Harry Frankfurt gives an account of personhood that necessitates a multi-tiered awareness of desires. A person not only has desires, but also has desires about those desires. Your homeostatic existence, its torture or its ease, depends on a constant tussle between levels of desires. 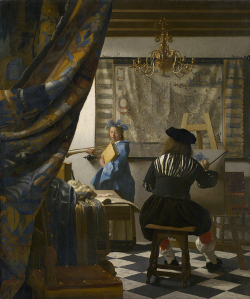 The artist can become hyper-aware, such as Vermeer painting himself painting. Characters can be hyper-aware, too. 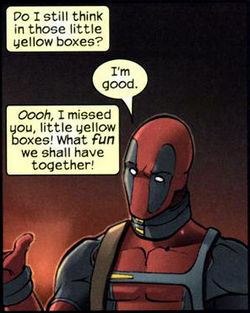 In the spirit of the times, Deadpool is the metacritic of his own modern story. There are flavors of awareness. One that’s had a curious taste for me is meta. Simply put, content that is self-referential and multiplying to no end. I’m not sure what the taste is like. My hunch is it moved from zesty to acerbic to lysergic. Let's explore that taste and try to figure out why, at certain times, we just don't like it. The next real literary “rebels” in this country might well emerge as some weird bunch of anti-rebels, born oglers who dare somehow to back away from ironic watching, who have the childish gall actually to endorse and instantiate single-entendre principles. Who treat of plain old untrendy human troubles and emotions in U.S. life with reverence and conviction. Who eschew self-consciousness and hip fatigue. These anti-rebels would be outdated, of course, before they even started. Maybe Wallace gets at the feeling by pointing to something direct, human. Shake a hand, lock ocular nerves, reminisce for a while. That’s direct. We’ve seen that. It’s either too contrived and superfluous, or as Wallace predicts, it’ll die before it picks up because it’s too banal. Or maybe he hits a nerve: We’re tired of stacking entendre’s, one-upping, and potpourri-ing our inner lives with out-of-context historical quotes. We’re digesting too much meta content too often and at some point it’s time to upchuck. For example, take one consequence of meta culture, hyper-irony. Let’s look at how the self-referential layers multiply at an unbearable pace. Situational irony is when an expectation is met with the opposite outcome. A meteorologist plans a vacation right in the eye of the storm. Modern day Don Juan never gets swiped the right way on Tinder. Your anti-meta culture quote is souped-up into a meta humor meme about your meta humor so that you can laugh at yourself laughing at others laughing about their laughing. Dramatic irony adds another dimension: audience vs. character perspective. On stage and in film, dramatic irony works effectively by contrasting what the audience knows with what the character believes, so it’s not just the expectation, it’s whose expectation that is important. Romeo thinks Juliet is dead, Schrader isn’t aware that Heisenberg is his brother-in-law, Luke doesn’t know Darth Vader is his father; but the audience knows. The audience waits for the moment when the character replaces his falsehood with the truth, already seen by the audience. An effective irony structure for comedy is that the characters are clueless about their absurdity, even within moments of reflection. Harry and Lloyd are too stupid to know they’re stupid (Dunning-Kruger Effect). Lloyd sells the van for a scooter and, in a moment of reflection, Harry says, “…just when I think you couldn’t possibly be any dumber…you go and do something like this, and…totally redeem yourself!” The audience expects the characters to figure out their stupidity, but they never do. Perspective in comedy evolves and shifts. In Groundhog Day, Bill Murray’s character and the audience are aware of the eternal recurrence of the day, but no one else is. The next natural, experimental step is hyper-irony: The characters are aware of the irony and will sometimes direct the audience to it. This can be done in Annie Hall fashion where Woody talks into the camera. The characters can also become aware of the absurdity of the situation. An absurdity occurs, the characters are aware of it, but just to reaffirm, one character responds with any of these shudder-producing words: ‘Really’,‘yikes’, ‘awkward’. Maybe meta is tiring because it’s ineffectively hyper-ironic. Maybe it’s something else. I asked a friend about this: “Why is it annoying when people try to be meta?” “Because people don’t know sh*t.” Perhaps it’s that each layer is just flimsy, and the bottom layer is just hot air. Behind the commentary about the commentary, there’s no complete idea—just BS. Harry Frankfurt characterizes ‘bullsh*t’ by the non-commitment to truth or falsity. Bullsh*t roams in a vast indefinite space. That makes it wasteful for knowledge. But it makes it a bit of fun. Maybe that’s a function of meta, too. It’s not for anything deep, anything actually meta, but just for fun. That’s why we get tired of and annoyed at meta content. We expect it to be more than what it is. 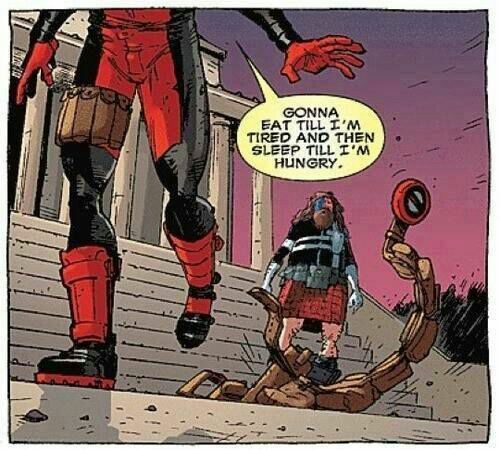 Instead, we can accept it and soup up our bullsh*t.
If you like the rebellion and resignation route, sometimes the Zen line is best: “The mountain is just a mountain.” Or, “When you eat, eat, when you sleep, sleep.” Maybe Deadpool said it better. The experience machine thought experiment in an increasingly virtual world: Will we be faithful to our philosophical methodology or our moral values? The experience machine thought experiment is widely thought to be part of an important objection to Internal Prudential Hedonism. Internal Prudential Hedonism (henceforth IP Hedonism) is an account of what wellbeing consists of. In other words, it is a view of what ultimately makes our lives go well for us. According to IP Hedonism, only the experience of pleasure ultimately makes our lives go well for us, and the opposite for pain. Things that we tend to like, but aren’t themselves experiences, such as money, are only good for us to the extent that they bring us pleasure or help us to avoid pain. Experiences of pleasure include all positive feelings, regardless of what caused those feelings, or what those feelings might lead to in the future. The experience machine thought experiment, made famous by Robert Nozick in Anarchy, State, and Utopia, invites readers to assume that they has been offered to spend the rest of their lives in an amazing machine that perfectly simulates a life full of wonderful experiences. When in the machine, any memory of deciding to get into the machine is erased, and no one ever realizes that they are in a machine as opposed to living in the real world. Most variations on the thought experiment ask readers to ignore their moral responsibilities to their loved ones and dependents, i.e., don’t decide for anyone else, just yourself. Readers also needn’t worry about missing their loved ones, as they will be recreated in the machine (and probably with some improvements!). If hardly anyone would connect to an experience machine, then there must be more to life than how our experiences feel on the inside. Why? Well, the machine offers the very best version of how our experiences could feel on the inside, and yet the vast majority of us still don’t go for it. And, if there is more to our lives than how our experiences feel to us on the inside, then IP Hedonism, which claims the opposite, must be false. This is the experience machine argument against IP Hedonism. P1) We have good reason to believe that the things which really matter to the vast majority of us are constitutive of everyone’s wellbeing. P2) If the vast majority of us don’t wish to connect to an experience machine, then we have good reason to believe that something other than the internal aspects of our experiences is constitutive of everyone’s wellbeing. P3) The vast majority of us don’t wish to connect to an experience machine. C1) Therefore, we have good reason to believe that something other than the internal aspects of our experiences is constitutive of everyone’s wellbeing. P4) IP Hedonism includes the claim that only internal aspects of our experiences can be positive constituents of wellbeing. P5) When a central claim of a theory contradicts a vast-majority judgement derived from a thought experiment about what matters, then we have good reason to believe that the theory is false. C2) Therefore, we have good reason to believe that IP Hedonism is false. I, and others, have many gripes about this argument, but we needn’t go through them here. Indeed, the weaknesses of this kind of reasoning does not prevent it from being the dominant form of reasoning in normative ethics. So, let’s go with it this time and see where it leads us. Now for a bold empirical claim: over the next 25 years, the responses of people who live in the developed world to the experience machine thought experiment will change so that the vast majority would connect to the machine. In some of my previous surveys on the experience machine, close to half of student respondents indicated that they would connect to the machine. I suggest that this number has been increasing due to the expansion of science fiction, virtual reality (VR), and massively immersive computer games. VR seems exceedingly likely to get better, more immersive, and more popular. Young gamers will become VR-sympathetic adults, and older people will be introduced to virtual reality rooms in their rest homes etc. These trends will make a life connected to an experience machine seem less weird, less scary, more realistic, and, most importantly, more acceptable. Our values will change such that living our lives in close connection with reality, really living our lives for ourselves, will not be considered important for our wellbeing, at least for the vast majority of us. Of course, we don’t know yet if this empirical claim is true (we’ll have to wait for a planned empirical analysis!) But, for the sake of argument, imagine it is true. How would philosophers, and especially normative ethicists, react to P2 from above being flipped around? Would they reject their previous methodology and still think that IP Hedonism is false, or would we stay faithful to the methodology and accept that IP Hedonism might be true, or at least that, if it is false, then it is for some reason not captured by the experience machine objection to IP Hedonism? And, finally, if the methodology is to be changed, then how? My hunch is that the vast majority of philosophers will continue to do what they have nearly always done: argue against IP hedonism’s main claim that only the internal aspects of experiences matter for our wellbeing.